While the majority of people think about the laundry room as a dark and ugly spot on the look of their homes, you should know that there are many different ways for you to improve its appearance. The best thing about these makeovers is that they don’t necessarily have to break the bank. One of the things that you could do is to turn the laundry room into a fun place. For this you should use bright colors, laundry baskets, and even adding mirrors to the wall. You also have to make sure that you have enough light so that you won’t consider the room a dungeon anymore. 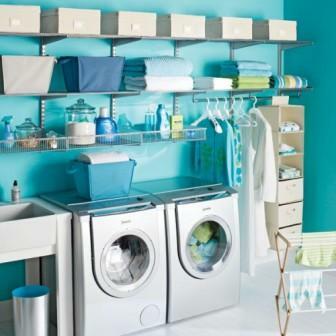 You can change the appearance of the laundry room even if you are on a tight budget. Sometimes it is enough to change or paint the cabinets. For instance if you have primed cabinet doors, you should paint them white to add more light to the room and to make it seem brighter. One of the biggest problems that the majority of people have with laundry rooms is storage. In order to make sure that you have enough storage space, you should add cabinets, shelves, hooks and bins. In order for the room to have a flow, you should make sure to use the same color scheme all over. These are two additions that could do wonders for your laundry room. You can use the laundry basket as an accessory besides it being functional. If you think that cabinets aren’t a necessity, you may want to go for a garment rack and hangers. One of the aspects that homeowners have to think about besides storage is the problem of space. In the majority of the cases the laundry rooms are relatively small which makes the room have a crowded feeling. If this is your case you should be looking for smart options for storage, such as a floor to ceiling cabinet. Although in the majority of the cases white isn’t the first choice of color when it comes to the laundry room, you should really give this color a thought. It makes small spaces look larger and it also add a clean feeling to the room. You should change those things in the laundry room that make you feel crowded or that give a feeling of darkness.